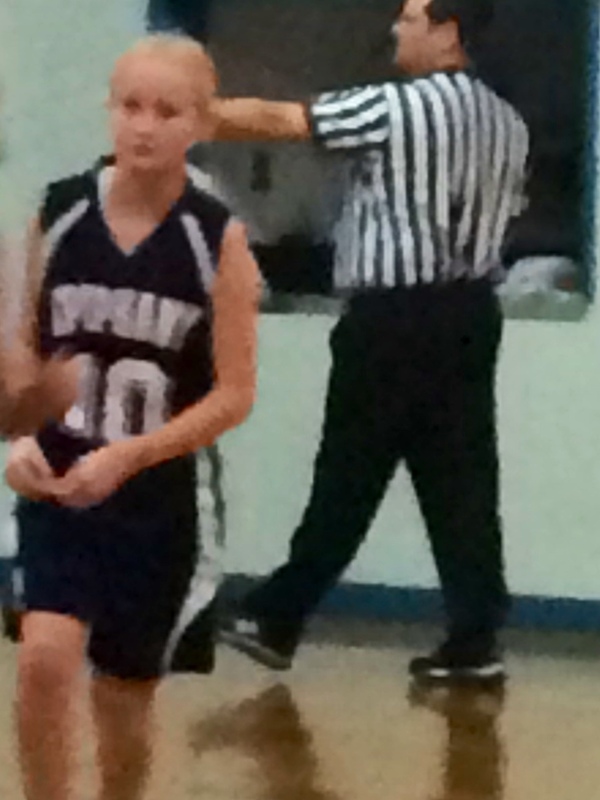 Yesterday was game day: my daughter’s debut on the middle school basketball team. 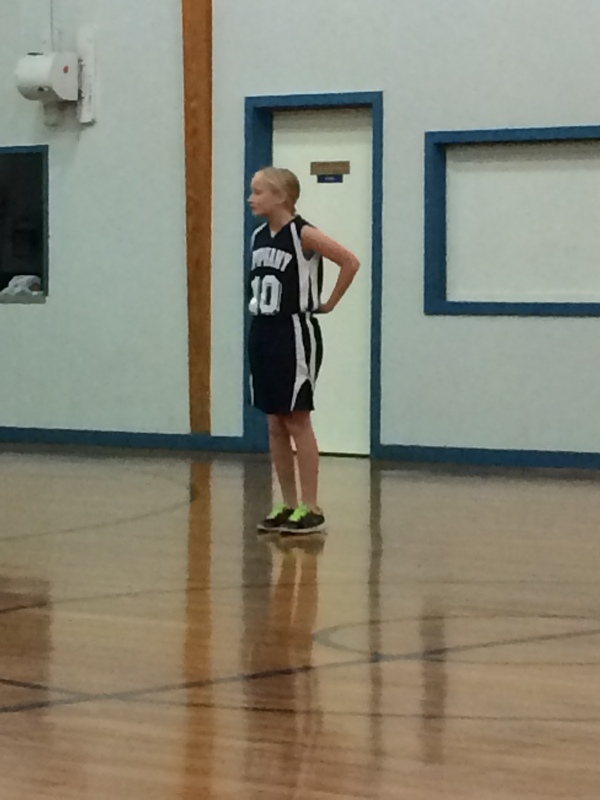 As most sports enthusiasts know, girls’ 5th-grade basketball is where it’s at. The NBA has nothin’ on the drama of a 20-minute scrimmage of tweens. The NCAA can’t compare to the fast pace surprises and amazing display of developing talent. It truly was a memorable evening. The three mini-games played last night were purposeful. Most of the young women participating were only just beginning to learn the rules of the sport. So, the shortened matches were a chance to learn by doing. (Sort of a toss the baby in the swimming pool approach) Dribbling a ball down the court in practice alongside your teammate only requires one set of skills. However, maintaining control of the ball while a ponytail covered in spirit ribbons whips you in the face is another. Practicing lay-ups and working on jump shots provides some building blocks of the basics. But, remembering which basket to aim at in the midst of screaming pre-teens and enthusiastic parents, now that’s an essential lesson all of its own. A friend and I were laughing as we watched. Some of the athleticism in unintentional plays was awkwardly unreal. In the split-second of receiving the ball, the ability to chunk it towards the side wall as if it were a football (or a soggy sock) takes amazing muscle reflexes. The agility required to scramble on the floor over jump ball after jump ball is not qualitative. We both agreed that we probably couldn’t imitate was we saw, even if we tried. And if we were to attempt such feats, there’s no way we’d last a full 20-minutes. Thankfully, my daughter has wisdom beyond her years. She was telling us before dinner the night before about this upcoming match. 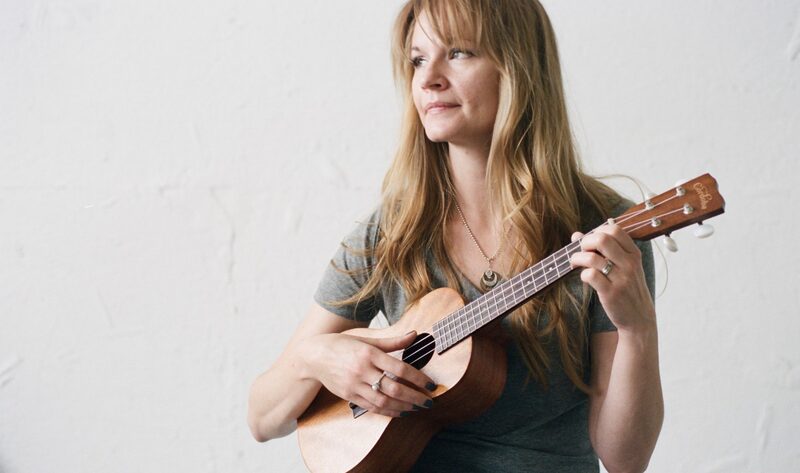 With great excitement she said, “Ya’ll have to come!…Come watch me fail! We are horrible! There’s no way we will win, but you have to come! It will be great!” Oh, my sweet, sweet, girl. I love that she held excitement in the sport, not in the hope of winning. I love that she didn’t merely want to play the game, but moreover wanted us to enjoy simply watching her play it. Wow. She has more self-confidence and security than most adults, including myself. I don’t know if I’d invite any of y’all to be spectators at an event in which I was assuredly going to bounce my own ball into my own face. She could have pouted. She could have turned red in embarrassment. She could have cried from the uncomfortableness of her awkwardness. Her hope, however, was not placed in points or winning. Her aim was to learn and enjoy the game. Many of us are in situations or circumstances that likely require us to learn. I’d argue that none of us is beyond spiritual growth, for sure. 2 Corinthians 3:18 says, “And we all, with unveiled face, beholding the glory of the Lord, are being transformed into the same image from one degree of glory to another. For this comes from the Lord who is the Spirit.” But how do we approach the opportunities to grow set before us? How do we approach our transformation? Do we listen to the Spirit to even discover chances to mature? Our fear in situations can cause us to rely on instincts that are better reserved for real-life-danger. Is it really necessary that I react to my children as if they were an attacker mugging me in the parking lot? Is it really necessary that when confronted with conflict I hide in a back room as if an axe murderer was hunting me down in my house? These reactions, while they seem completely rationale in the moment, only deprive us gaining wisdom and strength through trials. Rather than soaking in and absorbing wisdom, we repel it like water on a duck. We can also deflect the scary ball of responsibility onto others, but the lesson is for us. It always ricochets back. They have their own issues to deal with and their own path of maturity. Only we can deal with our ‘stuff’. Do we receive the hard things as opportunities of growth? Do we instinctually fling them into the air? Even if our acknowledgment isn’t as quick as the young girl’s, we will eventually feel regret that the opportunity to grow was lost. Another tendency is to over-analyze the situation and our position. There were some young athletes who really took to heart their defensive positions, that even after the ball had moved cross-court and was now in their team’s possession, they were still defending their territory. They got so lost in their assigned job, that they missed the larger lesson and flow of the game. There was no acknowledgment or rejoicing that their own team had the ball! Man, I do this every stinkin’ day. I get lost so easily in my tasks or seemingly designated position (usually self-appointed) that I miss the larger picture and the goal that Jesus is working me towards. I can over-think what I should be doing and how I should be doing it, that I miss valuable play-time. I forget that the purpose and plans to which God has called me are also ordained and controlled by him. I can become very self-focused on what I feel is a valuable priority, that unknowingly I am left standing alone, in a very defensive position, with only my check-list in hand. Meanwhile, the Spirit is yelling and pointing at me to get down court and help. Your team has the ball! Lastly, the tendency I observed in my daughter is the one that I hope to learn from. This is the tendency to joyfully engage. She was puzzled most of the time. She kept up with the team and when the ball came to her, she dribbled a few times and then passed it off to someone who had a little more experience. Over the course of the three-game evening, I saw great improvement in her understanding and her skills. She never perfected her skills, nor did she ever fully understand what was swirling on around her. She did, however, slowly transform from nervous and timid, hands glued to her sides, to quick feet with spurts of trying to steal the ball from the opponent. I watched as she fervently sought out the coach and his instructions throughout play. And, thankfully, she has a great coach, who is teaching the girls through encouragement and support. He could have gotten worked up about the lack of points on the board, the number of turn-overs, or the amount of double-dribbles. Instead, he guided each player only in a way that resulted in joyful participation. We left having lost, won, and tied at least once. My daughter, though she expected to walk away a “failure”, left with new knowledge, confidence, and deeper joy. I am thankful that she engaged the challenge of flying balls and twisted feet. I pray that I learn from her to have the same joy and courage when it comes to potential failure. I pray that I have the guts to invite others to come alongside me and witness my weakness and inability. I pray that just like her I find my value in something other than winning, gaining points, or being impressive. Instead, I hope to score steadfastness and maturity. James 1:2-3 says, “Count it all joy, my brothers, when you meet trials of various kinds, for you know that the testing of your faith produces steadfastness.” Every time a hurling challenge flies my direction, I can respond with thankfulness, knowing that the opportunity for joy and a strengthening of faith awaits…I just need to have open hands, elbows out, palms forward to receive it. After the game, we went to a sandwich shop for dinner as requested by our star-player. My jersey-wearing-girl ferociously downed her meal. She said, “Man, playing basketball is a good workout! I could eat two of these.” When we also engage with the circumstances laid in front of us–when we don’t run or hide from the difficult and sometimes intimidating things to which God has called us–we get a good workout and a healthy appetite as well. Our bodies and souls, while fatigued, become stronger and more steadfast. Our desire for Jesus and His word intensifies. We look less to unhealthy escapes or quick-fix wisdom because it just doesn’t sound good anymore. We’d rather be fueled through these hard times by the healthy life-giving and recharging Word of God and His encouraging Spirit. 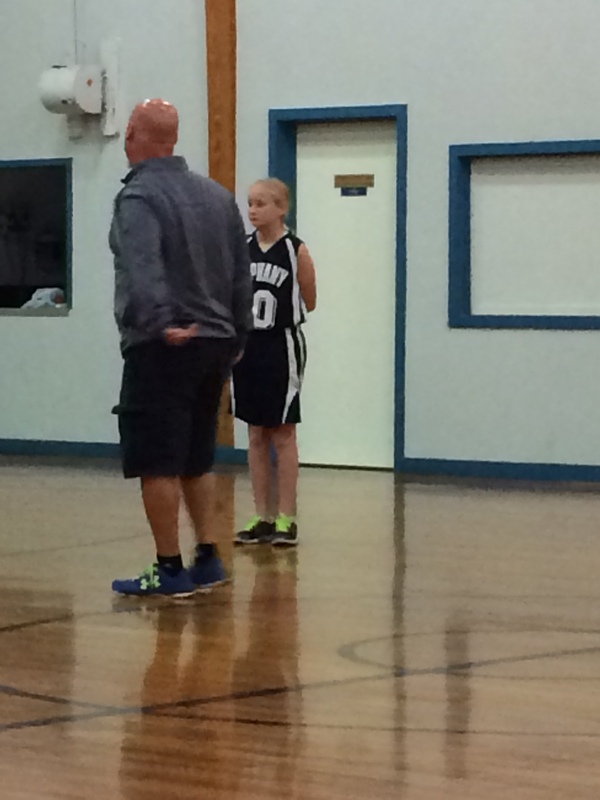 Thank you, God, for 5th-grade girls’ basketball. Thank you for the awkwardness, the confusion, and the spirit to confront fear with the best of friends. Thank you for my daughters invitation to watch her fail and for the safety she must feel in our relationship to take that risk. Thank you for coaches that speak words of encouragement and refuse to let us quit. Thank you, God, for the sovereignty of Your plan and Your testing through any circumstance. Thank you for opportunities to grow and to enjoy having a position on Your team. Thank you for gratitude and the joy that quickly follows. He prepares all things for our growth. What wisdom and beauty He is. To Him be all glory and thanksgiving! Thanks, Angie. Iâm proud of Ava! And Iâm proud of you and your writing —— Iâm always amazed at how you make applications and apply Scripture. She did such a great job. We are proud of her too! You will have to try and come to one of her games!